Step back in time and experience the way the Florida Keys used to be â€“ fresh seafood, strong drinks, panoramic waterfront views, outdoor dining and plenty of local characters. Tucked away in Safe Harbor, Stock Island, the Hogfish Bar and Grill is a true â€œlocalsâ€ spot that avoids the pretension and hype of more touristy areas. Donâ€™t let our casual and laidback atmosphere fool you, thoughâ€¦the food is delicious and always fresh. 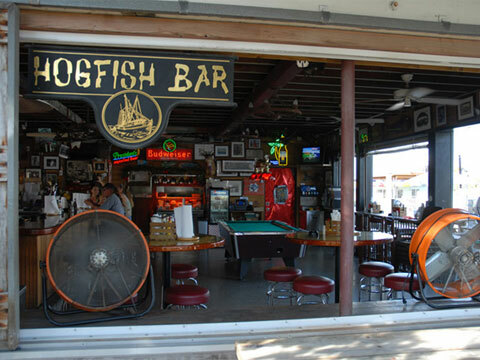 We have the best fish sandwich in the Florida Keysâ€”the restaurantâ€™s namesake, the World Famous Killer Hogfish Sandwich. A diver-caught fish with a flavor similar to grouper, this tasty sandwich served has earned a local and national reputation. Other menu favorites include the Baja Fish Tacos and Lobster BLT. Also, try our freshly caught Key West pink shrimpâ€”straight from the boats to your table! Be sure to check out the live music on the weekends and the great Happy Hour specials during the week. So, kickback and relax. Browse around our new website and get to know one of the Keyâ€™s best kept secrets. And, if you find yourself in the neighborhood, be sure to stop by, say hello and see firsthand why locals say the Hogfish is the best place in town.